we look at a project from all angles… and create the perfect solution for you. BEVIN Creative is passionate about the creative choices our clients make. We are fastidious with the tailored solutions we offer, and all projects we engage in are strategically considered throughout. Our directive is to always produce the highest quality creative solutions which successfully accommodates our clients’ intent and objective. As experienced brand advocates we understand the importance of ensuring consistency across all of your organisation’s work. We wholeheartedly believe in the power of strategic planning, as after all … failing to plan, is planning to fail. Our team of strategic thinkers differentiates from the conventional cut and dry approach, utilising their creative flare to develop one-of-a-kind strategies that provide to each of our clients varying needs. We strive to provide creative strategies that have the capacity to place our clients in good stead for ongoing success, forward thinking beyond the achievement of immediate results. BEVIN Creative’s team of marketing specialists work hard for all of our clients, managing their marketing, driving their business development and getting the maximum bang for their promotional buck. We work closely with our clients by asking specific, relevant and targeted questions – as ultimately, our clients know their business and we know marketing and communications. We learn about your business (or venture) to gain as much information as we can, including the key components, departments, service/product offerings and existing marketing endeavours and practices in place. We ascertain your short and long-term aspirations. We research the market opportunities and determine a positioning statement for your brand (with a key objective being the most appropriate and best opportunity to align with the short and long term goals). From this research, we may find your brand requires review and/or a transition to ensure you are evolving to how it should present … see branding. We provide a comprehensive market analysis, to determine your competitive position. This defines key internal and external factors, with a particular focus on the actions of your competitors in order to identify clear competitive advantages and disadvantages. Building from the solid foundation of preliminary stages, that has now determined who your brand is and where it sits within the market place, we develop relevant strategies and plans to drive your business (or venture) into the future. Planning within this stage may include the development of a strategic marketing plan, detailing the following (where relevant): PR plans, advertising and media plans, SEO plans etc. Within this documentation, we further cover details such as cost allocation, return on investment (ROI) projections, calendar phase roll-outs and other project specific requirements. Following our comprehensive research and planning, we implement the proposed strategic campaigns in execution of your business objectives. At this point, we effectively connect you with your target market. Capturing or collection of touch points is of the highest importance. We are also mindful of tracking (where possible) where, how and when these touch points occurred, not to mention following up every communication occurrence. Measuring the effectiveness of the strategies, plans, campaigns and sales processes are critical for development of future growth potential. We believe it is imperative to focus on the shortcomings, to ensure all weaknesses as well as strengths are maximised. We prioritise a collaborative approach with our clients, ensuring we continually meet the expectations of service delivery over the duration of our work. We pride ourselves on our mindful approach to customer service, which we believe differentiates our services above our competitors. We value the need for effective and efficient communication between our clients and their stakeholder groups. We engage tools of public relations (PR) in our service offering, to ensure our clients successfully engage in active two-way communication. We acknowledge the need for an integrated approach to PR, utilising both traditional and new media platforms to diversify our ability to cater to client needs. Whether the objective of communication is to increase stakeholder awareness, open up lines of communication or diffuse imminent issues through crisis communication, we cater to a range of needs. Our diverse offering in this realm is inclusive of social media, whereby we offer this form of communication to our clients where relevant. We determine the most effective platforms of use depending on your business and further establish these pages with the option for continual updates. Our knowledge of this field ensures that our clients go beyond simply ‘existing’ amongst a sea of competitors, to instead having a strong, strategic and unrivaled presence. We understand the importance of clarity, legibility and precision across all documentation for marketing and communication devices and mediums. We pride ourselves on our attention to detail and we always aim for the highest level of accuracy in our copywriting, editing and proofing. Branding is the ability to create a unique name and image in the consumers’ mind, through specialised techniques and processes. In the past, the common means of delivery has been through advertising campaigns with a consistent theme. Today, the playing field has grown greatly, becoming multifaceted and multidimensional. The purpose of branding is in establishing a market presence, which has the capacity to attract and retain loyal customers, based on the creation of meaningful stakeholder relationships. The retention of these customers is becoming more difficult in this expectant and transient modern world, where people want everything now and for the most cost effective they can get it. This requires the vigilance of brand managers who champion the brand and its evolution, activities and function across medium, community and device. A common misconception is that a brand is just a company’s logo. At BEVIN, we believe the logo is the lasting impression that is left with an audience, following the roll out of carefully planned and considered branding elements. These details encompass the corporate ‘identity’ of Apple and are what sets them apart from their competitors – more about “connectivity of a lifestyle choice” compared to a computer software company. The Apple brand has developed from 1976 with an apple in a tree, to the logo we know today (see the evolution below). At BEVIN, we aim to create brands that leave a lasting impression with stakeholder groups. This is achieved through engaging, considered design as well as brand consistency, continuity and clarity. In order to build an impressionable and strong brand, we clearly ask that our clients define in the preliminary workshop/ briefing stage whether they desire a brand that will last the test of time or alternatively a brand that has the flexibility to warrant growth in line with your organisation. Transforming verbally communicated concepts into a visual communication device takes skill and flair. Brand management is something the professional team at BEVIN Creative excel at. Once your brand is created, it needs to be monitored and managed to ensure the parameters and guidelines outlined in the creation stage are being adhered to. As difficult as this is, it is imperative to ensure the brand is not losing potency and that it is remaining the focal point. This requires a strong brand manager with a strong team. Permit us to guide you, and compel you into developing, maintaining and growing your company brand. Allow us to be your brand managers! The digital age has moved marketing into a new phase, where online presence and visibility has become a vital element in any marketing strategy. Good quality SEO will utilise and manage the content of your website to organically increase traffic from search engines, thereby increasing your online inquiries and/or sales without the use of paid advertising. With research stipulating that the majority of search engine users don’t scroll past the first page of search results, the need for SEO becomes pivotal. 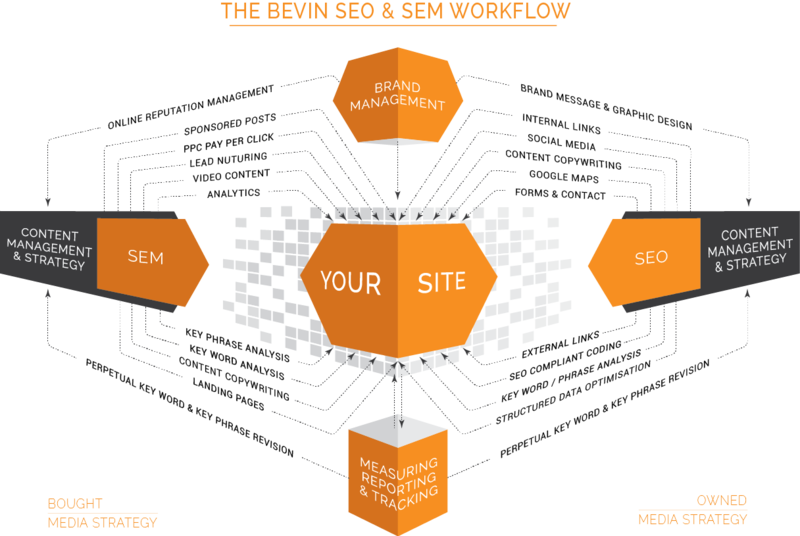 The BEVIN approach is to research the industry, perform an audit on the existing website and implement a clear and defined approach to improving the website ranking organically … effectively. With digital technologies at the forefront of day-to-day operations, it is increasingly likely that more people will visit your website as opposed to your collateral and advertising combined. It is imperative that your website works for you, as we acknowledge that a website contributes substantially to not only your brand but also to the growth of your business. If you’ve ever suspected that an ad is ‘following’ you, rest assured as it is true. Retargeting or remarketing is an effective tool that has the ability to advertise to your website visitors, beyond their time on your platform. This tool precisely focuses your advertising spend on online users who are already familiar with your brand, as seen by their recent activity on your website, and therefore may be more receptive to your advertising efforts. Through constant exposure, retargeting allows your brand to maintain a dominant position that resonates with potential customers, which may inevitably contribute to their decision to engage your business over your competitors. Retargeting works best in conjunction with other strategies, such as SEO and AdWords. As our name suggests, we love to be CREATIVE and we encourage imaginations to run wild – both the clients and ours. We embrace change (but not for change’s sake) and are always looking for an alternative new idea, to help deliver a project to it’s fruition. Our highly professional team has an extensive range of creative skills, allowing for the delivery of exceptional design work that consistently blows our clients away. Whether it’s ‘old school’ handcrafted techniques such as hand sketching and manual composition, or more digitally advanced techniques such as complex pixel manipulation and vector-based graphics, we embrace all forms of creative media and techniques. We have extensive experience in all forms of graphic design, and we tailor our creative output to cater for myriad projects; ranging from corporate branding and collateral, to stylised promotional material and digital identities. We have highly skilled personnel who can take a project from concept to end product within specified time frames and budgets, whether it be for digital or printed mediums. Our highly creative team uses their sophisticated 3D Visual skills to generate world class quality 3D renders & 3D animations, which will undoubtedly impress you. We have the skills, the tools, and the passion to deliver the most cost effective, market driven solution for every project. 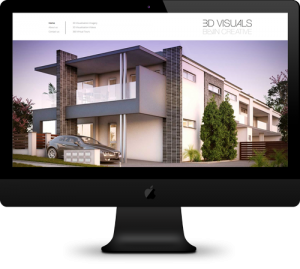 We pride ourselves upon our versatility within the modern world of rendered 3D visuals, as seen in our ability to provide still renders (floor plan, internal and external), interactive panoramic virtual tours, animated build up videos and fly through videos. Our team also provides 2D visual services, that can be incorporated into either still, moving film or video formats. Our work in this area has the ability to not only enhance the look of your project, but also provide the architectural details and finishes that can often only be seen once the building has been completed. Our team at BEVIN understands that each and every project is unique, and so should be treated as such. We tailor our 3D Visuals perfectly from concept to completion of each client. In today’s digital age, the importance of a strong and effective website is paramount. At BEVIN, our digital specialists understand this. The websites we develop are not only beautifully designed, but more importantly, they have the capacity to effectively link our clients with their stakeholders in a user-friendly manner. Whether our clients are in need of a complete website set-up or a one-off ‘refresh’, we can cater to all web requirements. We undertake a collaborative approach with our clients through the process of website development, ensuring that we have a thorough understanding of expectations, resulting in a seamless service delivery. The quality of our professional photography and video production is a large component of our service offering at BEVIN Creative. We recognise that imagery has the potential to be the cornerstone and base element, which can help define the initial look and feel of any creative initiative. Through clever briefing and planning in initial phases, our team can develop a clear strategic understanding of the project. We attribute our thorough preparation to our ability to capture the ‘perfect shot’, time after time. We have the capacity to fulfill any and all requirements in the realm of filming and production; from raw footage, to editing and post-production. With vast experience in the production of videography, our talented team can deliver on a range of projects, from initial concept through to final product, with the guarantee of quality. Our team has equipment available for filming at both outdoor and indoor locations, including drone cameras that have the capacity to capture impressive aerial footage. We offer a full-package service in this domain, including elements such as voice over talent and recording, integration of 2D and 3D graphics, multimedia, DVD interfaces and much more. An online advertising service, AdWords places advertising copy with search results as displayed by Google. We undertake thorough preliminary research thoroughly, ensuring that we select the most relevant and effective search terms that ultimately will have the capacity to link potential customers with your product or service. Extending from this, we further track and measure the success of the placed AdWords on a continual basis, providing valuable insight that allows us to perfect our approach. We step into the shoes of your target market as we attempt to understand their go-to search terms, to ultimately decipher the link between you and your desired clientele. This comprehensive approach to Google AdWords has the capacity to pull quality traffic to your website. It's no question that social media should be a part of any digital strategy. In today’s modern business world, it’s no question that social media should be a part of any digital strategy. You need to be present where your customers are spending time, and your customers spend a lot of their time on social media. Whether or not you’re communicating your latest product/service offering, broadcasting inspiring company news, or maintaining an open dialogue with your clients, social media provides a powerful marketing tool that can reap measurable rewards. But it needs to be done right. Whilst most of us having social media accounts, there is a distinct difference between user-based and corporate-based social media. We specialise in how best to leverage social media in the corporate space, to ensure that the resource you allocate is translating into results for your business. Whether or not it’s via strategic content creation, content scheduling, social media advertising or platform engagement, our modern social media techniques are designed around building and maintaining a strong online presence. We work closely with you and your team to ensure that we are communicating effectively, regularly and with the right tone of voice to support your brand. With years of experience under our belt, our professional team are ready to either build your social media presence from scratch, or to take your existing social media to the next level. If content is King, engagement is Queen. Social media for business is a technical exercise of engaging and communicating with your clients, it is not just a broadcasting medium. The secret to social media success is providing value to your followers. In today’s business world, consumers have more power and influence than they have ever had. Whether or not it’s showcasing positive feedback and sharing customer satisfaction with networks, or broadcasting a negative experience to the masses, consumers these days have the right to public opinion given the freedom of speech within social media. During these situations, how you respond as a company is imperative to your online reputation, and this is where where we work closely with brands in both prevention and reaction methods of crisis management. Consistency is key and time is money. Should social media form part of my business plan? Which social media platforms should we be on? What content should we publish? How regularly should we publish content? How do we measure the effectiveness of what we’re doing? Contact us to obtain a quote and we’ll be back in touch with costs shortly. When it comes to effectively communicating your brand through the power of text, this can often become a challenge. Considerations on wording, tone, detail and flow can all affect the readability of a document, whether or not it’s online or offline. Our copywriting experience and skills have been formed through years of collaborative work with clients across a range of industries. We enjoy the process and challenge of communication and we enjoy working with clients to ensure their online and offline messaging is clearly delivered to their target audience. We do this in a way that stands out, in a way that generates results. Whether or not it’s online or offline text, we can help deliver copy that clearly communicates your brand objectives to your clients in a way that is clear, welcoming and easy to read. We write with clarity, personality and professionalism, which ensures your brand is represented in the best possible light. The right text for the right platform. The way text is written will ultimately depend on the platform it is used on. Print collateral and advertising materials need to be snappy enough to cater to short attention spans. Websites are non-linear, so there needs to be careful copy consideration around which page a customer will land on when they visit a website. Search Engine Optimisation can also play a vital role in which words are selected for website text and how this impacts traffic and conversions. Social media text is also unique, as each social platform has its own language. Rest assured, we speak all of them, fluently. Regardless of what the platform is, we have the experience and skills to provide well planned, tightly written copy that hits the brief every time.